Happy Halloween from Lord Pumpkin! Happy Halloween from your favorite anthropomorphic Pumpkin! It’s the first episode of The Wrath of Aladdin Podcast, hosted by Caine Dorr! In this episode, Caine cracks open the classified files of the Ultraverse’s very own Ultra Intelligence Agency: Aladdin – hunting for data on the mysterious Ultra otherwise known as SOLITAIRE. What did you think of the show? Send questions or comments to: UltraverseNetwork@gmail.com. We’d love to hear from you, especially your thoughts about this issue of Solitaire or the character Solitaire in general! You can find other Ultraverse podcasts on iTunes as part of the ULTRAVERSE NETWORK feed. Subscribe and leave a rating and review in iTunes! Thank you so much for listening! Next week: The second episode of the ULTRAVERSE PODCAST: PRIME OF YOUR LIFE! 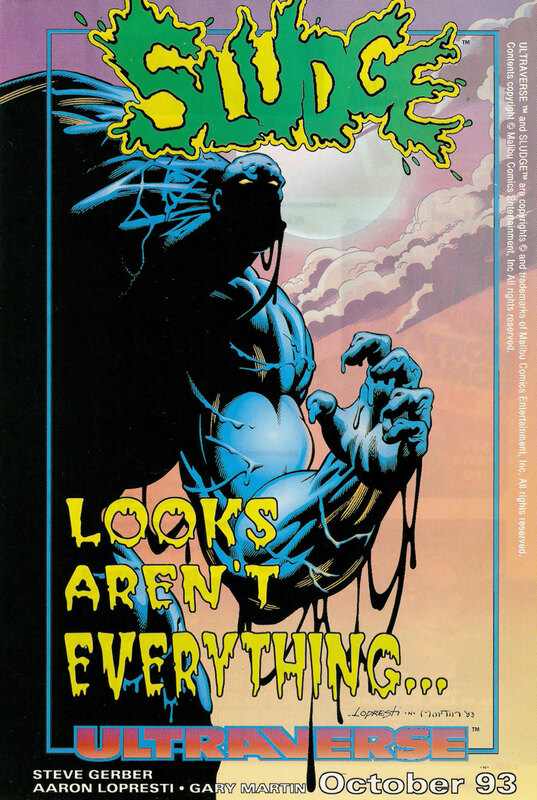 Sludge coverage is coming to the Ultraverse Network soon! Let your excitement build with this house ad for your favorite Ultra Muck Monster! Who is Jinn and how about that left jab? Hello there Ultraverse fans. David Sopko here. I’ll be covering Firearm for you. Hope to branch out to some other titles, but got to keep my focus right now. Why Firearm? Why the Ultraverse even? It all started back in 1993. That was not the beginning of my comic book fandom…that started with young Dave watching Spider-Man on The Electric Company…no, 1993 was when I discovered James Robinson, and in turn Firearm. Then, the rest of the Ultraverse. Honestly, I had read some of James Robinsons Terminator comics without thinking too much about his name. Then I got hold of The Golden Age. A mini series from DC Comics, and I fell in love with his writing. I happened to be in a comic shop one day talking to the owner about James Robinson and how much I enjoyed his writing. He grabbed Firearm 1 – 4 off the shelf and told me to give these a try. He told me that the book was part of something called the Ultraverse. But I didn’t have to read any of that to get Firearm. Well, my 23 year old self got home and quickly read through the books several times. The Break-Thru event had happened, and I was curious about it, even though it didn’t really effect Firearm. 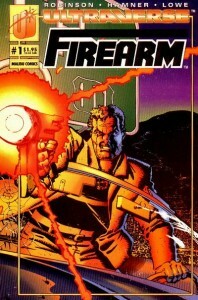 The fact that George Perez was involved was also a plus. 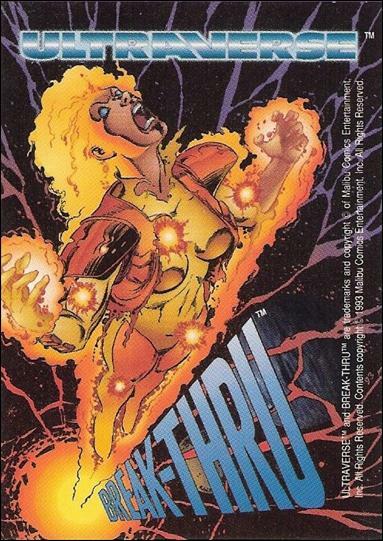 I grabbed that the next day and soon was grabbing all of the issues of the Ultraverse that had come out up to that point. I mean, there were all kinds of writers and artists that I knew working on these titles and that really appealed to me. The cohesive universe they were putting together drew me in. From that point on, I collected everything I could. Met several of the creators over the years and have a lot of signatures on many books. I missed a few issues here or there towards the end of the Marvel Ultraverse period, but have narrowed that down to one issue to go. In my contributions here. plan on reviewing the issues of his series, but the movie that they produced as well. 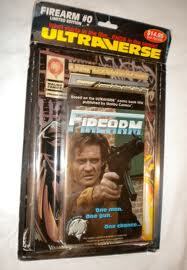 Showing off the trading cards associated with Firearm. As well as showcasing the heroes and villains that appear in the book, as well as running through the literary works that James Robinson threw in the book. There will also be crossover issues to talk about, featuring Prime and a slew of others that were affected by The Rafferty Saga. So…got my comics. Got my movie. Got my binder full of Ultraverse trading cards. Have my Ultraforce figures ready (even though Firearm was never produced for the line…boo.) I’m all ready…hope you’re all ready to Jump In with me. When the Ultraverse launched, there was no doubt about which superhero team was # 1… as much as I adored Freex, you knew that if the world was imperiled it wasn’t going to be Sweetface and Plug who were going to get the call. The Strangers were one of the original launch titles and they were prominently featured in house ads, crossovers and the like. 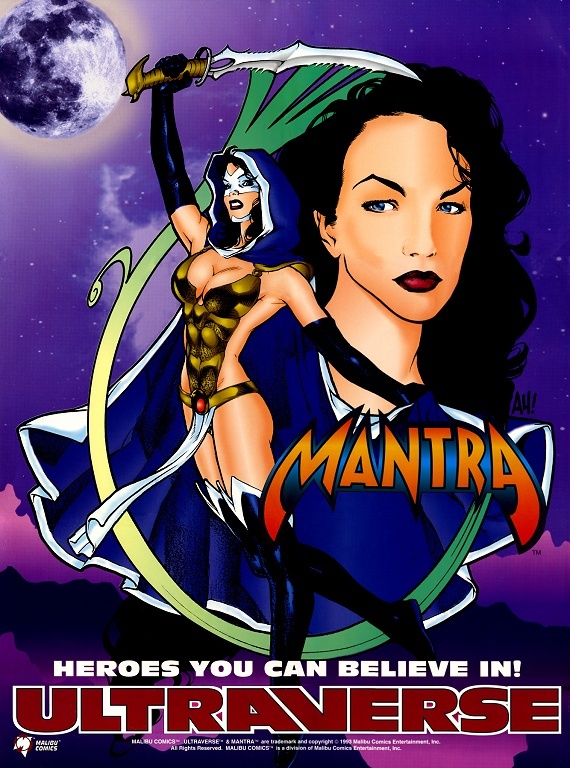 So why aren’t they remembered by the more casual (i.e., pitifully Ultraverse-unaware) fans? I’ll tell you why: Ultraforce. From the moment the Ultraforce was announced, The Strangers slid backwards in terms of importance. 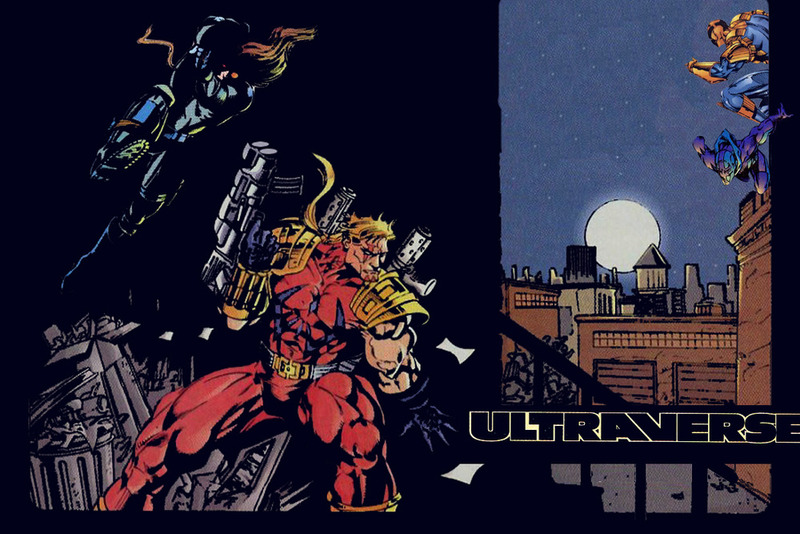 Ultraforce was the Ultraverse’s Avengers or Justice League, featuring their heaviest hitters and most popular solo stars. 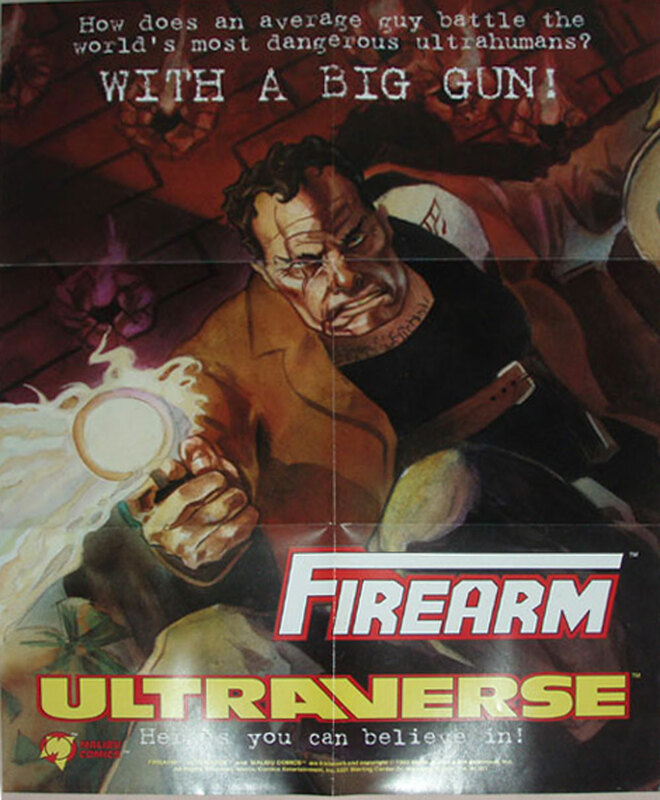 While The Strangers were united by a common origin, the Ultraforce was united by the old trope that they took on villains too powerful for individual heroes to face. Plus, you had George Perez handling the art duties on the early issues of Ultraforce. As much as I like Rick Hoberg, that’s not a fair fight! And when the Marvel crossovers began, who battled against and alongside The Avengers? Hint: it wasn’t The Strangers. When The Black Knight moved over into the Ultraverse, was he fighting Atom Bob for leadership of The Strangers? Was it Electrocute and Grenade starring in their ongoing animated series? 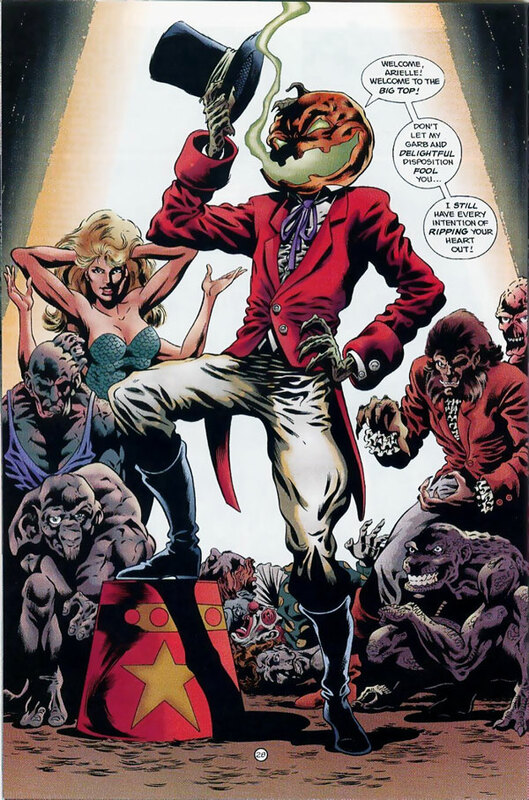 Sadly, no – though most of The Strangers did get to guest star in the Ultraverse toon. For me, I’ll associate Ultraforce with the beginning of the end… the coming of Marvel and the losing of the Ultraverse’s focus. That’s not to say I didn’t enjoy parts of that series — hell, I’ll argue to this day that Topaz was a great character and you can never go wrong with Perez on art. But I’ll always hold a grudge against Ultraforce for knocking The Strangers down a few pegs. How does an average guy battle the world’s most dangerous ultrahumans? WITH A BIG GUN! Heroes you can believe in! Mantra! It’s the first episode of The Night Man Podcast, hosted by Ben Avery! In this episode, Ben talks about two origins: The Night Man’s, as seen in the pages of Strangers 1-3 and The Night Man 1, and Ben’s own Ultraverse origin! What did you think of the show? Send questions or comments to: UltraverseNetwork@gmail.com. I’d love to hear from you, especially your thoughts about this issue of The Night Man or the character in general! Next week: The first episode of the WRATH OF ALADDIN PODCAST! The Ultraverse Network is dedicated to celebrating the fun and excitement of Malibu's Ultraverse. The network features ongoing podcasts covering a variety of topics, including Night Man and Solitaire. Our blog features regular coverage of The Strangers, Sludge, Firearm, and all your other favorites. The network is a collaborative effort built by the fans, for the fans. This site is not affiliated with Malibu Comics or Marvel Comics in any way. Who Are the Ultra Fans? Copyright © 2019 Ultraverse Network All Rights Reserved.